The boomerang is a multi-position bracket stand for the iPad. 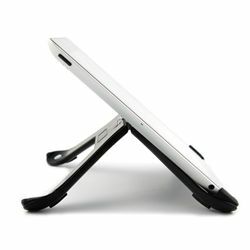 Its middle joint can be adjusted to create the perfect angle for chatting, browsing or typing. Snap it all the way open and magnetically attach it to the included MultiMount for hands-free use. The MultiMount can attach to magnetic surfaces (like a refrigerator), a polished surface (like glass), or can be screwed into almost any other surface. System is compatible with iPad 2, iPad (3rd generation) and iPad (4th generation) (not compatible with iPad Air or iPad mini).